A woman sits at a laptop computer. Woman: Honey, look! I found cheap flights. 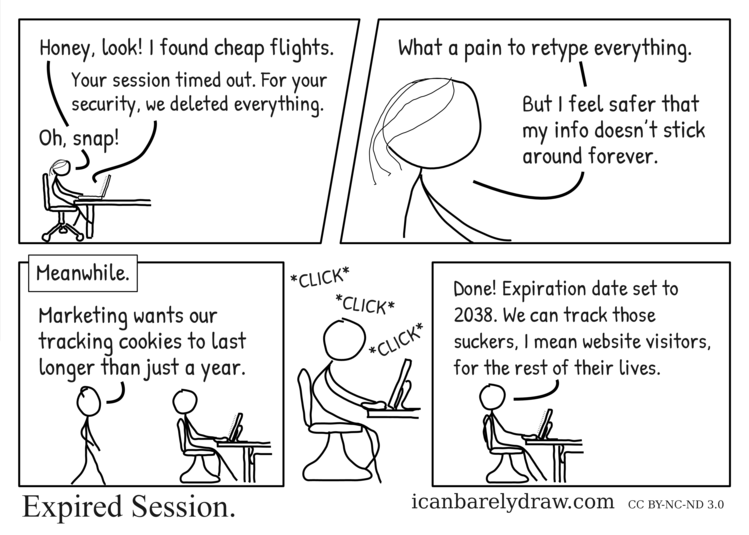 On laptop screen: Your session timed out. For your security, we deleted everything. A close-up view of the woman is seen. Woman: What a pain to retype everything. Woman: But I feel safer that my info doesn't stick around forever. In the next panel, man 1 sits at a laptop and man 2 approaches him from behind. Man 2: Marketing wants our tracking cookies to last longer than just a year. Man 1 is seen leaning towards the laptop and typing on the laptop keyboard, and *CLICK* *CLICK* *CLICK* sounds surround him. Man 1, apparently looking back with one arm draped over the back of his chair: Done! Expiration date set to 2038. We can track those suckers, I mean website visitors, for the rest of their lives. Um… sorry to be that guy, but where is the joke?